We are having our first race of 2013 on the 2nd of January – The Craig Partridge Yachts “Round the Islands Race”. A bottle of rum for the handicap winner of each of the 3 divisions A,B and Traditional (designed before 1960). The bar will be open after the race and there will be complimentary bar snacks and a light menu from the restaurant. 11am start and our usual $5 entry fee. 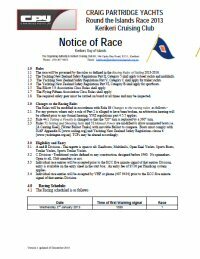 The Notice of Race is here and on the KCC website along with the sailing instructions.